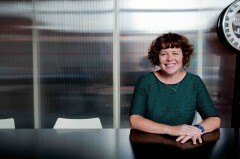 Sally Tallant is the Artistic Director and CEO of the Liverpool Biennial – The UK Biennial of International Contemporary Art. She was formerly Head of Programmes at the Serpentine Gallery, London where she was responsible for the development and delivery of an integrated programme of Exhibitions, Architecture, Education and Public Programmes. Since 2001 she developed an ambitious programme of artist’s projects and commissions, conferences, talks and events. Recent projects include The Edgware Road Project, Skills Exchange and Turning the World Upside Down, large-scale sculptures by Anish Kapoor in Kensington Gardens and Disassembly with Runa Islam, Christian Boltanski, Yona Friedman and Faisal Abdu’Allah. She has curated and organised exhibitions in a wide range of contexts including the Hayward Gallery and artist-run spaces, hospitals, parks and public spaces. She has also curated performances, sound events, film programmes and conferences including initiating the Park Nights series in the Serpentine Gallery Pavilions and co-curating the Serpentine Gallery Marathon series with Hans Ulrich Obrist. She is a regular contributor to conferences nationally and internationally. She is a Trustee of the Chisenhale Gallery and Raking Leaves, the External Examiner for MA Fine Art at Central St Martins.